The Trianium iPhone XS Max Clarium case brings out the beauty of your phone while ensuring that your phone stays protected. A simple yet elegant design for those looking for a minimal look. Note: Compatible with most of iPhone XS Max Screen Protector. 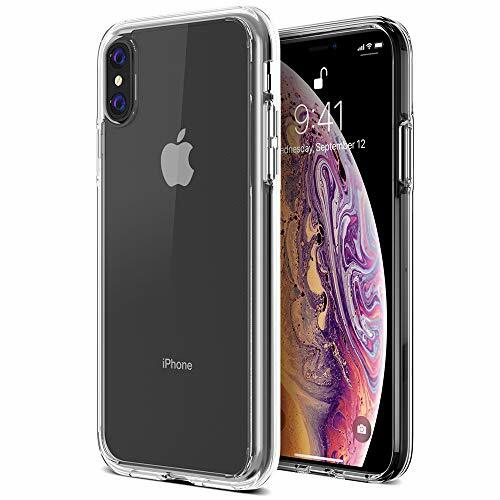 [Compatible with Apple iPhone XS Max Smartphone (2018 6.5" Display]] PREMIUM PROTECTION - Featuring two layers of protection: a shock-absorbing frame that protects against drops, and a solid, durable body that protects against scrapes, bumps and more. DESIGNED FOR iPhone XS Max - This Trianium Clarium Case for iPhone XsMax is made to perfectly fit your iPhone with precision cutouts for all ports and the camera hole. Also featuring raised bezels to lift phone screen and camera off flat surfaces. PREMIUM TPU BUMPER - Shock absorbing, scratch resistant bumper and durable polycarbonate backplate provides long lasting protection from scratches, scrapes and every day wear. Also provides a super slim profile and an easy grip.